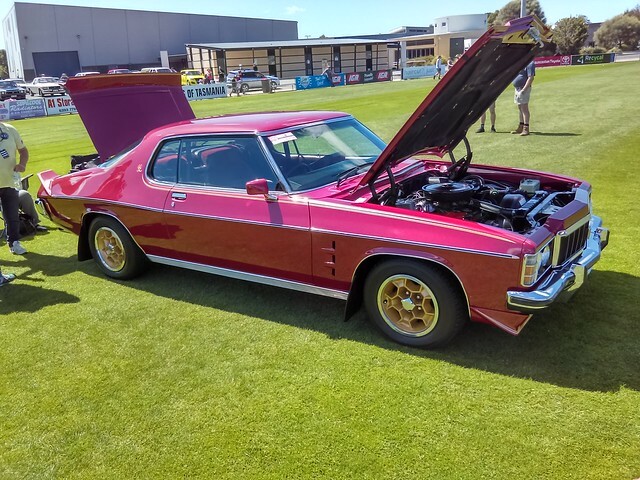 The 2018 Monaro Nationals in Launceston have been fun, run and won. I know a few regulars here made it down, and for those that didn't you missed out big time. One thing that stood out to me was the standard of cars, and that there are still some amazing original cars which are so rarely seen. I thought it was an excellent event, and I'm interested in what others thought if it. Sounds good. What was your favourite car? A fabulous event, great cars, great people and for the most part great weather. Almost 70 HK, T and G Monaros from survivor to concourse, something for everyone. A great credit to Jesse Denholm and his team who put the whole thing together. Now there is a question almost without answer. As Monaro23D said, something for everyone. 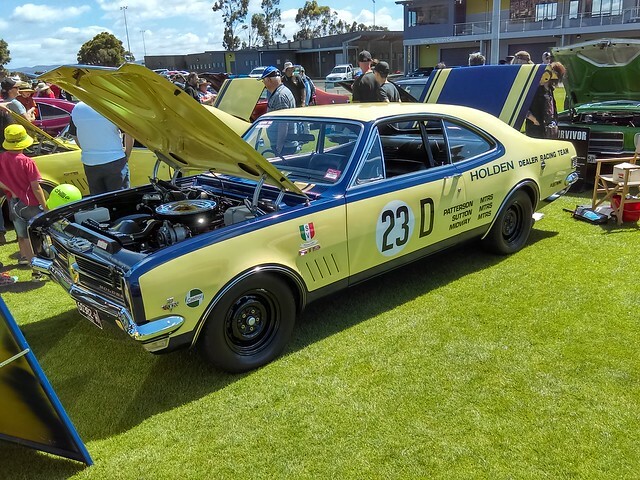 Let's start with his car - how often do you get to see a genuine ex-Bathurst car? 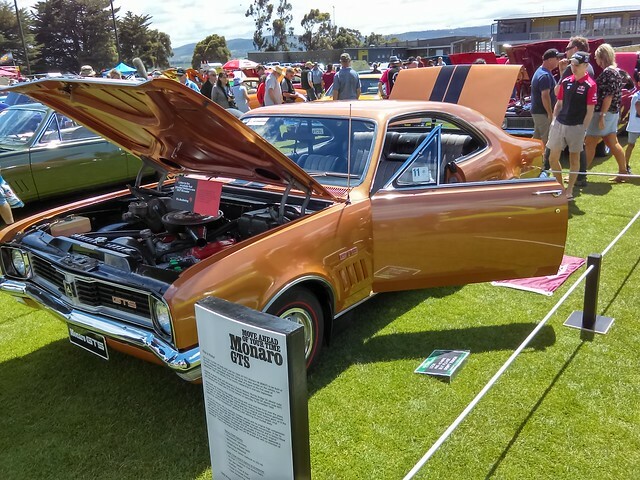 A credit to Monaro23D for making the trip to Tassie and letting us see the car. Many of the custom cars were done to an incredibly high standard, as were the concours and restored cars, but it is the survivor cars that stick in my mind. How about a very original Silver Mink very early 2nd type HK327 Monaro with a mint interior with under 50,000 miles? Or a 2 owner Pinaroo HK base model which, due to a respray, was ineligible for survivor but finished a strong 2nd in Factory Authentic. 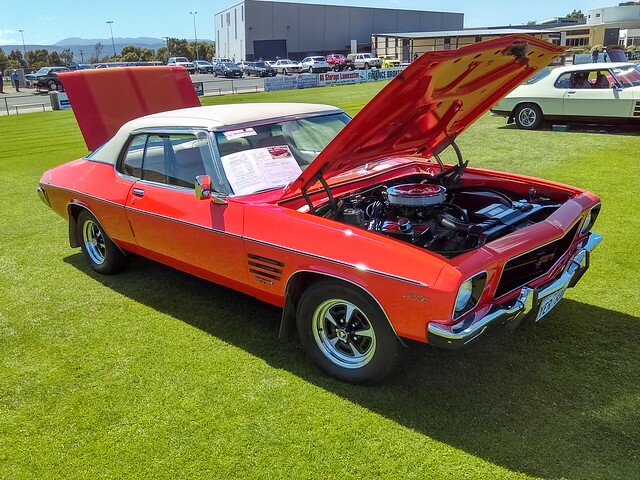 There was also a very original HK307 Powerglide Monaro, also with minimal alterations from original and also with a mint interior, and an unbelievable HQ Monaro base model. The winning car was a Daytona Bronze HT GTS which had to be seen to be believed. An ex-Bonneville salt flat racing Warwick Yellow HK was also a contender. It was driven to every event, and even competed in the Motorkhana. I reckon it was the meanest sounding car of the event. Though I'm not into HQs, I fell in love with a HQ GTS coupe in Blackwatch. A lovely car. Like I said at the beginning, maybe I'm fickle, but I fell in love many times in four days. Well worth the visit. 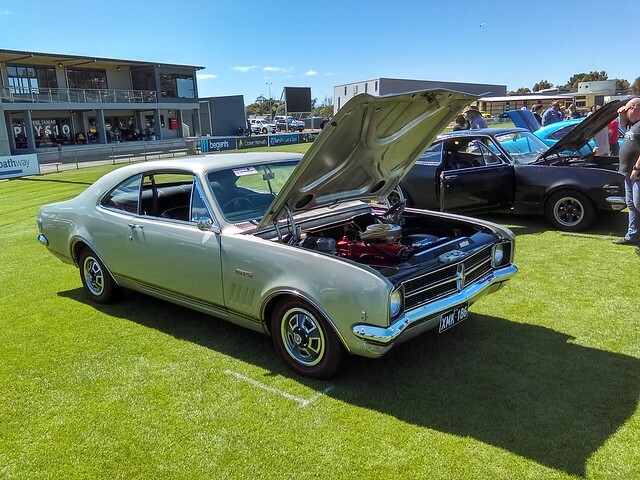 There were some really nice Monaro's there, I had a few favorites. Great to see a few 6 cylinder ones there. The HQ GTS that nearly went over the Tasman Bridge was a nice addition, was wondering if it was there. Was also a very nicely restored HK GTS 186S as well, I kept going back to it for a look. The unrestored GTS 327 was very nice too. Yes. It won the Survivor class. They were all beautiful cars, the survivor Silver Mink HK GTS was beautiful, apart from the front was a totally different colour to the rest of the car. Anyone know why? Surely the paint difference wouldnt be that bad from factory? I didnt see any other cars with much advertsing/paraphernalia on display. Does the owner/entrant get more points for all those cool items with his overall display? I liked it. If it was an Elizabeth or Mosman Park car they were like that from new as the front panels were painted at a different time to the rest of the car. The Silver Mink HK327 Survivor had a replacement HT/HG front fender which had been repainted and lost points as a result. The winning HKTG survivor Daytona Bronze HT GTS didn't get "extra points" for the accessories, but if it had come down to a tie between two cars may have made the difference. As it was, it just wasn't that close. The scoring used for 2018 Tasmania was a demerit system. Mosman park did not finish any Monaro, all WA Monaros were sent there complete. The reason the front is different to the back is most likely due to the repairs that had to be made to the silver mink car. Unless there are two second type GTS 327s with red trim, Silver mink paint and black vinyl roof. I have photos of the car after it came out of the shed and was washed. there are some earlier photos going around of it before it was washed. The photos show both rear quarter panels buckled from a shunt up the rear. As there is no other damage I would suggest it was pushed by a front end loader or similar and creased the quarters for some reason. I did see the car a few years latter and asked how they repaired the 1/4s and I was given a very dirty look and told there were no repairs made. The interior was pretty good and looks like it has scrubbed up ok. If it’s the same car I know of from Newcastle the LH front guard was damaged too and has been replaced as Geoff says. It also only had 3 original shocks in it. According to GMH records Mosman Park did assemble some Monaros and Brougham Warren. 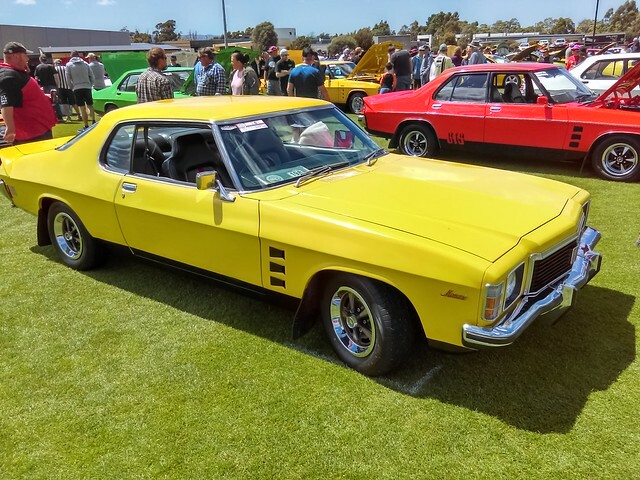 I have at least two HK Monaro (186 man and 186 auto), a HK GTS (V8 auto) and a HK Brougham listed as Mosman Park Pilots. Whether they did any volume production HK Monaro I do not know, but there are no Monaro in HT pilots unlike other plants that do have them. We made the trip down in the HT. Great to catch-up with the Sydney members and others who I had only ever emailed and received replies from after a call for assistance (GM5735 for example). In that regard it was well worth it. Tasmania is a really great place to drive and I, and I know a few others, were disappointed there was not more of that; they are cars after all. We ditched the Symmons Plains race event on the Sunday (where there was a major accident that thankfully the driver was not obviously hurt in) for a drive to Beaconsfield and a loop east through some hills and back into Launceston. It would have made a great drive for the cars and for Beaconsfield as well. If our HT completed that journey no problems (with minimal tyre/guard clearance) then others would not have had a drama at all. Why the display was on the Saturday and not the Sunday was also rather curious. Let's get the cars out, have a drive to pique local interest and then put them on display. This maximises exposure for the locals and gets the cars on the road to visit local spots of interest. Location for the display was great, as were the arrangements for scrutineering. Jessie did a lot of work and he did a great job. Sunday evening was a bit 'lost'. We arrived en masse and a little late due to taxi 'dramas'. This resulted in the club sitting wherever we could secure a seat among the seated guests. I am not an 'auction' fan and believe the evening dragged due to the bidding. If you have to have auctions, I have seen 'silent auctions' work well, leaving time for the guests to chat, mingle and dance if there is music- yes even car people. We stowed the HT and spent the following two weeks touring in a 4WD hire car; great experience. Car of the show for me was the tubbed silver mink HK with red interior. Not sure why other than it looked tough (plus the owners had tips on great apps for everything from cheap hire cars to storage sheds and campers vans in the NT). Ah ok, I thought the Daytona Bronze was presented very well with all the extra items. I thought owners had to have a display board telling a story or something to get extra points. 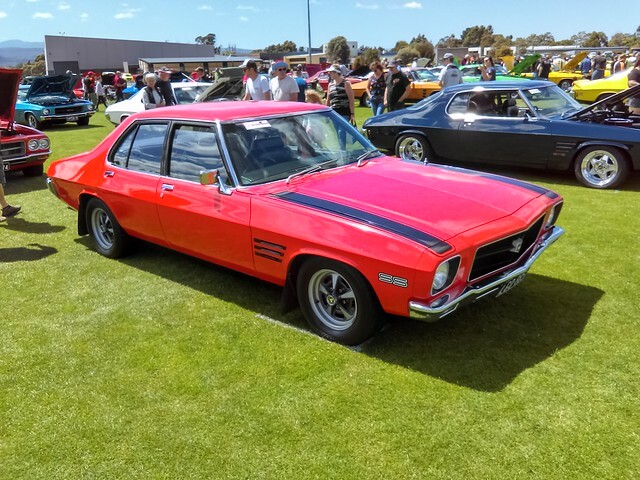 I think for future nationals owners should be encouraged to display their cars similar to the HT and the concours Blue HK GTS and show off all their cool memorabilia, there should be a new judging section out of 5 points on how people have gone to the effort to display their car. Just imagine how many cool items people have stashed away, just waiting for it to be put out on display for all to see. having all those extras does not add or subtract from the originality of the car. I have tried to have a group display of memorabilia in the past, but was too difficult to organise. I just love when people put all their paperwork and rare items out on display that tie in well with their car, bit like back in the day when the dealer would put all the extras on and have bright flashy signs around the car. Its better than just sitting locked away in a shed. It adds to the overall look and appeal of the car. phisical car itself as it would have drove out of a Monaros dealers door. whatever that may be. If you think you have something special. Leave the car to be judged on its own merits in the particular class it is entered. Not all the add ons. 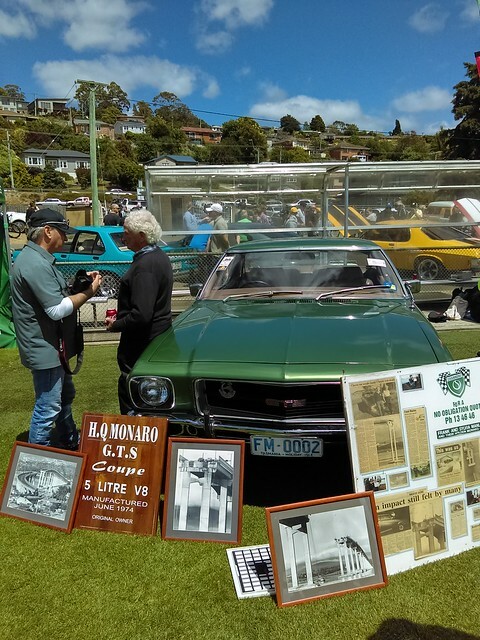 Otherwise you’ll end up handing out trophies for the biggest collection of Monaro STUFF.The car itself would be an incidental part of the display. Keep them separate. A car on display here. And in another class over here the incidentals. I’m sure there will be as much interest in one class as the other. You never know what might just turn up in the other class. people have been hiding for whatever reason. never otherwise come out or people never ever knew existed. It would add another new dimension to what is Monaro. What sort of things do you think are out there that may be different. May be interesting, old, new, whatever. Of course there is a lot of reference material. There are related things that in their day, no one was ever really interested in. .Any ideas what’s out there that could be in such a class.